It seems that almost every week a new mirrorless camera is being launched at the moment -- and this week it's the turn of the Pentax K-01. Designed by Marc Newson the 16MP CMOS sensor camera comes with all the features you'd expect, including full HD video, shake reduction and HDR mode. While the K-01 is also compatible with all Pentax K-mount lenses, it is also delivered with the world's smallest fixed focal lens -- the new XS 40mm f/2.8. 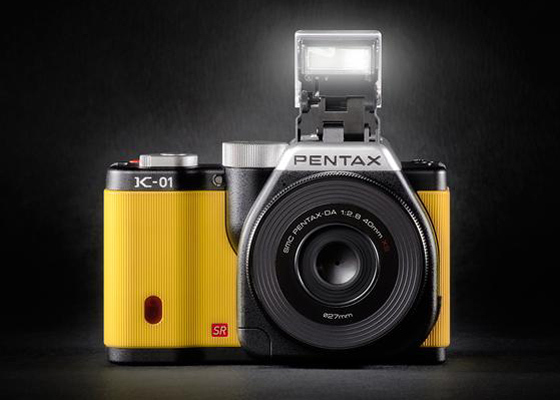 A spokesperson for Pentax said: "Newson’s K-01 is a modern digital camera with a contemporary yet timeless design. "The body consists of clean and simple lines creating an elegant graphical composition whilst preserving all the functions of a professional camera. "The combination of machined aluminium and natural rubber provide the user with a tactile and durable piece of technology." Newson added: "I wanted to create something that represented quality and expertise in photography. Some of my favourite photographic devices have been Pentax products. "I wanted to return to the high quality roots of the brand and create something which was really unique and iconic."